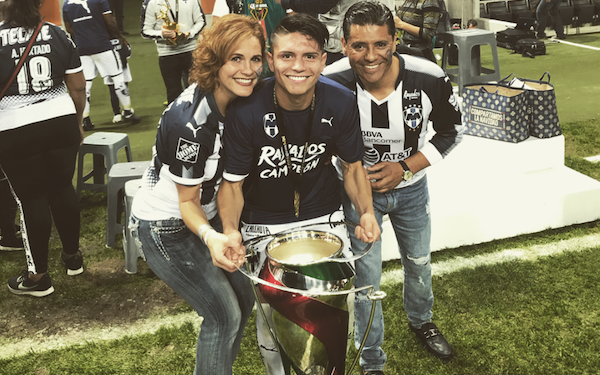 After earning a starting spot in Monterrey's midfield last July, 18-year-old Californian Jonathan Gonzalez helped Los Rayados finish Liga MX runner-up and win the Mexican Cup -- and was named to the Liga MX Best XI. Gonzalez grew up in Santa Rosa, California, 55 miles north of San Francisco. What he achieved in the last six months is extraordinarily rare for any young player, from anywhere in the world. Jonathan Gonzalez with parents Mireya and Alonso. One of the richest teams in the Western Hemisphere, Los Rayados are bankrolled by beverage and retail company FEMSA, Mexico's second largest company according to Forbes. Gonzalez's teammates have played for the national teams of Colombia, Argentina, Uruguay and Mexico. The California-born Gonzalez has played for the USA from the U-14 through U-20 national teams, but is also eligible for the Mexican national team because of dual citizenship thanks to his parents' heritage. Within a five-month period, beginning with his July 22 debut, Gonzalez played 27 games for Monterrey in Liga MX and the Copa MX. 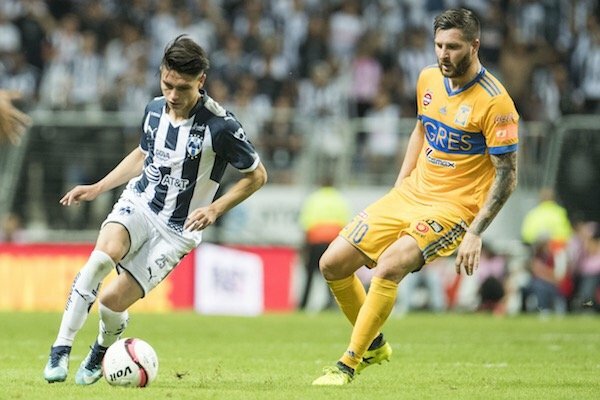 We spoke to Gonzalez during his Christmas vacation to his California home, which he left at age 14 after Monterrey was one of 13 Liga MX clubs that offered him a trial at the 2013 Sueno Alianza. SOCCER AMERICA: How do you account for getting so much playing time this season -- as an 18-year-old on a team of veterans? JONATHAN GONZALEZ: I felt like I had a really good preseason for the first team. It really helped me figure out my role. My teammates really helped me a lot. At the beginning, in the preseason, in the first two or three games, I was a little bit nervous, but the coach [Antonio Mohamed] talked to me, and my teammates talked to me, and told me just to do what I’ve been doing throughout the preseason training. Show what I’m capable of doing. Right now, I’m more of a defensive midfielder but I also like to attack. What position did you play on the Monterrey youth teams? Attacking mid – we played with one holding, two attacking. What was it like for you to leave home? Did you have any hard times, wondering whether the sacrifice would be worth it? When I originally got there, it was probably one of the hardest things I’ve ever done. Leaving my family at such a young age. And being there by myself was really hard. But after a while I got used to it pretty much. There were a lot of people who helped me out right when I got to the club. My normal day was, wake up, practice, and then go to high school in the afternoon. It was a Mexican public high school. It was different, but I liked it. How was your Spanish when you arrived? So so. We spoke Spanish at home. The challenge was learning to write. What was the soccer like? It was more complicated and competitive than what I was used to. Anything in particular that you think helped your development? Once I got there, I started playing one or two years up, and it’s always been like that, playing up. And the youth teams play the same schedule as the first team? We always played on the same day as the first team. We traveled to the away games. We did everything pretty much the same as the first team -- but we played in the morning -- against the same opponent, in the same place. It was an awesome experience. Something new to me. At the Sueno Alianza National Finals, in 2013 in Los Angeles, you got offers to try for 13 Liga MX teams. How did you end up at Monterrey? Alianza was great experience. They’re the main reason why I’m in Monterrey right now and I’m very thankful to Alianza for all they’ve done for me and for all the other kids who are trying to make their dream a reality. ... I visited different clubs. Monterrey felt like home. My teammates, the people around me, made me feel at home. Your first call-up by the U.S. youth national team program was in 2012, with the U-14 team, then coached by Hugo Perez, right? Yes, I'm very thankful to Hugo Perez. He had a big influence on getting me to where I am today. Perez also coached Weston McKennie and Christian Pulisic, did you play much with them? They're older, but once or twice I got called in with them. While at Monterrey, you took several trips with the U-16s, U-18s, and were on the U-20 team when it won the Concacaf tournament to qualify for the 2017 U-20 World Cup. How did you like those trips with U.S. national teams? We went on a lot of trips abroad and it was honestly one the greatest experiences I ever had -- being with the national team -- and I’m really thankful for that. Jonathan Gonzalez played for Atletico Santa Rosa before leaving for Monterrey. I wasn’t called in, in November. Personally, nobody came and talked to me and let me know about that friendly. I just wasn’t called in. At the moment, I really haven’t thought of it much. I focused on my club because of the finals and all of that. How much influence did your soccer-playing father, Alonso, have on your soccer? He started coaching me from when I could walk till about 10 years old. I heard he took you to train on the beach? Yeah, he'd take me running in the sand. I think that's why I don't stop running in games now. How much soccer did you play on your own? We spent most of our time playing soccer, me and my brother [Adrian, who is now 14]. We’d got out and shoot, kick some balls. And we played in the house all the time. We broke a lot of stuff. Windows, vases, holes in the walls, ruin dinner sometimes. Our parents would get really angry. But now they think it was worth it? 12 comments about "Californian Jonathan Gonzalez reflects on his remarkable rise to teen star in Mexico". beautiful game, December 31, 2017 at 12:38 p.m. Waiting to see how this young player develops and how the USMNT staff assesses him. Wooden Ships, December 31, 2017 at 1:24 p.m.
Not even contacted about the November friendly. I want to say that surprises me. Tab doesn’t select him for the U-20, that does a little, unless, well better not go there. Our national U’s and senior team have been under poor leadership. But then, it’s a select group influencing the ship. I have my preference for the new Prez, but no vote. I’d like to see Hugo as our next Manager, for goodness sakes he has the skill and knowledge to bring us out of this interminable malaise of sorry soccer. Jonathan, happy holidays and it’s a joy watching you play. If it’s me, the next USMNT manager selection, will decide my senior team direction. Bob Ashpole replied, December 31, 2017 at 3:25 p.m. Consider timing. If he gets called up for a "friendly" then he is not playing with his club. U20 call up same thing. Clearly Gonzalez has taken advantage of his time with the club. Why would anyone want to take that opportunity away from him? National coaches have to consider what is best for the athlete. Ric Fonseca, December 31, 2017 at 5:10 p.m.
First, Jonathan MUCHSIMAS FELICIDADES Y SUERTE EN 2018! Tambien igual de felicidades y suerte a los Sres:Alonso y Mireya. Second, as for Jonathan not even have gotten a call up, know what folks, something like this, doesn't surprises me, since the total ignorance of the big shots and mucky-mucks in US Soccer, filters from the top on down to the coaching staff. I am very disappointed that he wasn't called up, but this complete lack of knowledge about Latino talent is endemic of the US Soccer Coaching staff, and then after something like this happens, every one ends up crying over spilt milk and into their 3.2 beer. Third, while I would like to see him play for the US MNT, hell, if the Mexican MNT signs him first, well, pilgrims, ALL THE POWER TO YOU JONATHAN, and I will be amongst the first to crow over your accomplishments, and continue to throw my support in your favor. As for Alianza, yes, I've been very critical of them, simply and because it is such a money making venture for them, e.g. exploiting the Mexican/Latino youth of our communities, but what the hell, I just wish they would identify more Jonathans, or Alfonsos, or Juanitos, 'cause know what amigos, there are literally thousands of them playing in the barrior, comunidades, etc. As for Mr. Ashpole's comments that "Why would anyone want to take that opportunity away from him...(sic)"? I really don't see this/your point Mr. B.A., and to think that "national coaches have to consider what is best for the athlete,(sic)", come now, do you REALLY think they take this deeply into consideration? Lastly, to repeat, FELICIDADES Jonathan, and if the MexMNT comes a-knocking-on-your-door, heck, answer it positively 'cause IMHO, the USMNT will not. Wooden Ships replied, December 31, 2017 at 5:20 p.m.
Well said Ric and absolutely accurate. Bob Ashpole replied, December 31, 2017 at 9:58 p.m.
None of those are going to cap tie him. Maybe the coaches overlooked him, but if I was the coach I would be reluctant to pull him away from his club. The November friendly conflicted with the club schedule. A January camp would conflict with his club schedule too. I would certainly be talking to him, which I understand USSF didn't do. No explanation for that. Wooden Ships replied, December 31, 2017 at 11:25 p.m.
For me Bob, the no contact is inexcusable and is endemic of our national team for many, many years. Ric touched on it, for as long as he’s been posting, as has Hugo Perez and others, that we have chosen our style of play by omitting the more skilled on the ball players. I’ve known this personally for decades now. Jonathan and many like him have consciously not been invited into the club. The result, unimaginative, averagely skilled national teams, relying upon a fighting spirit to carry us forward. What I’m speaking of (style change, led by like minded former players) has been drowned out by the powers that be. In other words, the ones that didn’t possess that skill, style and imagination that’s existed in the states for years. It comes down to the frame of reference. It goes hand and hand with the argument that so many believe that if our best athletes played soccer we would be a powerhouse. Too many are still letting that influence our perception of the sport. Anyway Bob I value your opinion but as Ric has intimated this is a control issue, both latent and intended. As Pirlo stated, less running more playing, and that’s not just an MLS issue, it’s national. That’s the problem. We need a major shake up in style leadership. Happy New Year Bob, Ric and Soccer America. Bob Ashpole replied, January 1, 2018 at 4:55 a.m.
WS I don't think I disagree with you and Ric, so much as I am not as quick to blame a lack of desire to play a better game. I suspect that the difference is a lack of experience with USSF on my part. I will say that I am disappointed in that nothing appears to be happening as far as the MNT when we should be busy rebuilding the team for the 2022 cycle. It should be a 5-year cycle but we are apparently wasting the extra time. With some exceptions we should be building a team around a core of players currently 24 and younger. Is USSF in some kind of management crisis and unable to function? Wooden Ships replied, January 1, 2018 at 11:52 a.m.
Bob, I think there has been a lack of desire to play a better game, because it would mean abandoning what the majority play. It would leave out what’s, to this point, the archetype US player. It largely has been an English style of player that’s been identified and held in esteem. That’s been the measuring stick, not the type of player capable of playing in Southern Europe or Latin America, where better touches on the ball are found. There is no denying soccer is very political in our country and the USSF is not exempt. Even without the Russia failure or play isn’t very skilled. Did you detect a jealousy-envy of CP by his own teammates during his play with the National team? Did you notice the reluctance to come to his aid during repeated and often times flagrant fouls. Perhaps it’s my imagination, but he isn’t suppose to be that good at his age. And, the thing is Bob, we’ve had talented players like him before that fell through cracks or didn’t meet English style standards. Sorry for the rambling, but it’s frustrating that we are still facing this archaic mentality at the highest levels. Bob Ashpole replied, January 1, 2018 at 9:53 p.m.
No time like the present to move in a new and better direction. To me better skills and better tactics don't replace the physical aspect, they just add 2 more ways to dominate your opponent. In terms of the order of development, mentality first, skills second, then tactics and last in line is physical (strength-endurance). I would agree if you said that sometimes it seems youth coaches have their priorities reversed, concentrating on physical maturity and tactics to exploit the physical maturity. I also blame the focus on developing youth teams to win competitions instead of developing players. Pardon me, but that seems like how to develop piano carriers rather than piano players. Right Winger replied, January 5, 2018 at 10:20 a.m.
Ric, you are right on. Our National Team Coaching particularly at the younger levels is atrocius. There have been so much good talent bypassed not only Latino's. I am going to tell you that there are more kids that are going to come to the front just as this youngster did and please note that the National Team Coaches bypassed them for whatever reason. Concerning the NT coaches doing what is best for the kids (athlete) that is BS. Technical ability is overlooked so much by these coaches it is a shame. Until a change comes at US Soccer we will keep getting what we have been getting. If a kid carries dual citizenship go for the team that is the real thing. In my humble opinion. Good luck to this young man as he moves on. R2 Dad, January 3, 2018 at 4:51 p.m.
Hugo would know what to do with this kid, and would definitely bring him into the next camp. If you're good enough, you're old enough. Contrast Hugo's CV to everyone else's--no comparison. I'll bet US Soccer/MLS is desperate to appoint a new head coach ahead of the Feb election. "Remain calm, all is well". Bruce Arena = Kevin Bacon.